BARCELONA -- Audi believes it will be the first automaker to launch a self-driving car even though its first model with that capability, the new A8, still needs to undergo lengthy government approvals that could allow a competitor to pass the automaker in the race to market. 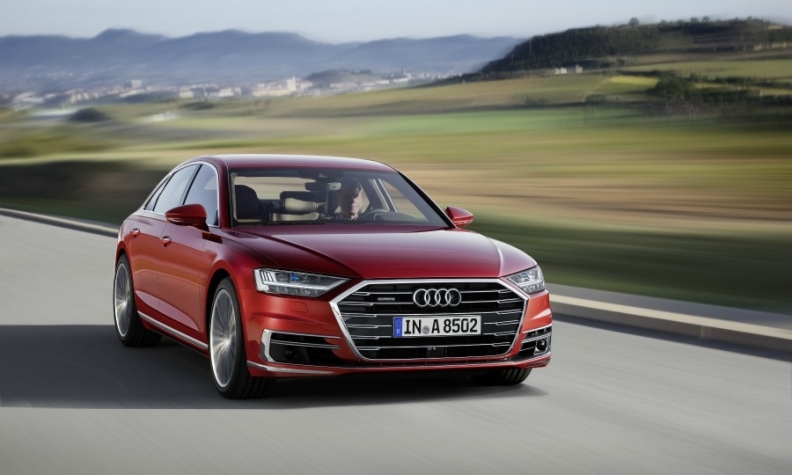 Audi said that with its forthcoming Traffic Jam Pilot, the A8 will be the first production car with Level 3 autonomy. That means under specific conditions those A8s can be put in autopilot, allowing the driver to take his eyes off the road. All other current production vehicles, including those from Tesla or Mercedes-Benz, offer Level 2 autonomy, which provides assistance but requires near constant interaction from the driver. Level 3 autonomy, however, is still in its infancy. That is why Audi hasn’t announced when Traffic Jam Pilot will debut and why BMW only plans to offer the same level of autonomous technology in 2021, with the debut of the iNEXT. “We’re in uncharted territory and the authorities are too,” Mertens said. Audi and type approval regulators need to resolve how to properly regulate how the technology should function in everyday conditions. Mertens expects a staggered global rollout of Level 3-capable versions of the sedan with Traffic Jam Pilot as the technology gets legally approvals. While some global homologation procedures are similar, in several countries the process may have to start from scratch. Mertens, who joined Audi in May from Volvo where he served in the same capacity, said the key goal is to ensure drivers always know when they will be held accountable for operating the vehicle. “It’s either the driver or the car — there can be no shared responsibility," he said. That potential gray area is one reason several carmakers are reluctant to offer the Level 3’s limited autonomy. Volvo, Toyota and Ford say they will leapfrog Level 3 and concentrate on reaching the most automated stages, Levels 4 and 5. Mertens promised that Audi’s Traffic Jam Pilot would provide full autonomous functionality in the instances it’s designed for. One thing is clear: Audi has already ruled out the availability of Traffic Jam Pilot when the A8 sedan launches later this year. This also true in Germany, where Level 3 cars, in theory, can now be legally operated on domestic roads — as long as they have been approved for sale by authorities. It remains uncertain whether A8 customers will be penalized if they purchase the car before the approval process is completed. When pressed whether early buyers could activate the dormant function at a later date, Mertens declined to commit, instead indicating he might be able to say more toward the end of this summer. Even if the regulatory approvals in other countries are slow, Audi remains confident no competitor is positioned to overtake it with this fledgling technology.